The United States Congress designated the Aldo Leopold Wilderness (map) in 1980 and it now has a total of 203,548 acres. All of this wilderness is located in New Mexico and is managed by the Forest Service. Named for one of history’s most influential conservationists, the Aldo Leopold Wilderness protects the roughest, wildest portions of one of New Mexico’s roughest, wildest corners: the Black Range. The Forest Service manages this 202,016-acre wilderness, which was established in 1980 and lies just east of Forest Service Road 150 from the even bigger Gila Wilderness. Terrain The Aldo Leopard Wilderness drapes the southern spine and subsidiary ridges of the north-south-running Black Range, mostly composed of Tertiary-era volcanics. McKnight Mountain rears to 10,165 feet in the southern portion of the wilderness, marking the highest summit in the range. The topography is rugged, consisting of sharp ridges and broad benches broken by deep canyons. The Continental Divide hugs a portion of the Black Range crest to 10,015-foot Reeds Peak, where it curves southwestward out of the wilderness. Major drainages include the Mimbres River, Diamond Creek, and the headwater streams of Seco Creek. Some springs and creeks are seasonal, while others are perennial. Ecology From canyon riparian communities of willows, cottonwoods, boxelder, and Arizona sycamore, slopes in the Aldo Leopold Wilderness rise through juniper, pinyon, ponderosa pine, and oak woodlands to about the 7,000-foot level. 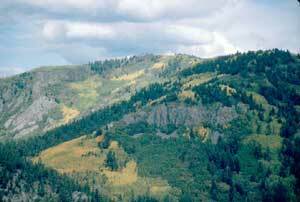 Higher montane and subalpine forests include Engelmann and blue spruce, white and subalpine fir, and quaking aspen. Wildlife is rich. Small creatures include numerous kinds of lizards, snakes, rodents, and bats, while medium- to large-sized mammals range from gray foxes, bobcats, and ringtails to coyotes, black bears, mountain lions, mule deer, and elk. The Wilderness also falls within the U.S. Fish and Wildlife Service’s recovery area for Mexican gray wolves, first reintroduced into the region in 1998. Notes The Wilderness is named for Aldo Leopold, a pioneering ecologist and conservationist best known for his seminal 1949 text on the “land ethic,” A Sand County Almanac (and Sketches Here and There). In his early career, Leopold worked for the Forest Service in the Southwest and was instrumental in the designation of the country’s (and world’s) first wilderness area, the Gila Wilderness, which adjoins the Aldo Leopold Wilderness. A 33-mile-plus section of the Continental Divide Trail traverses the Aldo Leopold Wilderness, and there are also many miles of additional hiking trails. Planning to Visit the Aldo Leopold Wilderness? How to follow the seven standard Leave No Trace principles differs in different parts of the country (desert vs. Rocky Mountains). Click on any of the principles listed below to learn more about how they apply in the Aldo Leopold Wilderness.